In the cow problem, there was a 10 x 10 farm. The farm had a 100 foot rope connected to a corner with a cow at the end of it. Our objective was to find out how much area of land the cow could roam, and how much grass the cow can eat. My group constisted of Brandon, Anna Nicole, and Moi. We began this problem by writing it out, and drawing a picture of it. We drew the 10 x 10 barn with the cow connected to the 100 foot rope that we placed on a random corner. 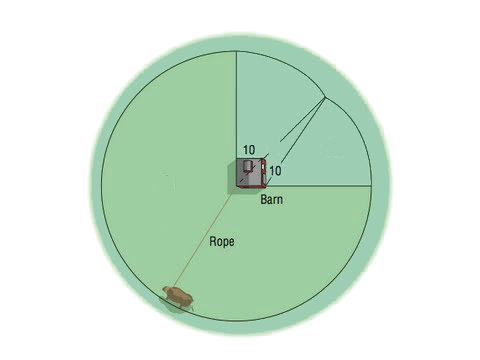 We then made a circle around the barn starting from the end of the rope. After each corner we would subtract 10 from the rope. Because of this, we could not make a normal circle and it would always end up being cut off and looking weird. We ended up creating 3/4 of a circle and made two triangles in the missing area of the circle that we nicknamed the "pizza slices" for fun. We did the triangles because of the rope getting shorter and shorter each time, we called that area the "turning point". We needed to break the circle into pieces that we already knew how to solve for. We had to use the formula π r^2(.75) to find the area of 3/4 of the circle. We got 7,500 from this and multiplied it by Pi. 7,500 * 3.14 = 23,561.9. This enabled us to solve for more shapes in the circle. We got two triangles in the area that we were trying to find. We needed to find the area of those two triangles but first needed the height, so we used the pythagorean theorem. With the pythagorean theorem, we got 89.7. We then need the base of the triangles so we did it once again and got 14.14. After this we were able to find the area of the triangles by simply plugging the two answers into a=b*h/2. For the area of the triangles, the answer was 634.2 feet. The next thing to do was to solve the area of the pizza slices. We used SOH CAH TOA for this. We used it to find the angle measurements. My group and I knew that one of the angles was already going to be 45 degrees since a straight line is 180 degrees. We solved for the middle using SIN. We then had to find the third angle by solving for x. We put 49.53 over 360 and we got the answer of the pizza slices which was 3,501. We then added all the area's up and subtracted 50 which was the barn. The answer was 31,148.5 feet. That is the area that the cow can graze around the farm. For this problem, I think my thinking was pushed a bit more. When we first began this problem, I was so confused. I had no idea where to start. I just followed what my group did and started going from there. My group was a big factor in solving this problem. Without them, I would have been stuck the whole entire problem and not have moved up. I was able to understand more of what was happening when we got further into the problem and mostly when things became more visual since I am a visual learner. I would grade myself a B on this because of how effectively I worked with my group and how much I got done with them. I also thought that I did good because of the visual components in it.